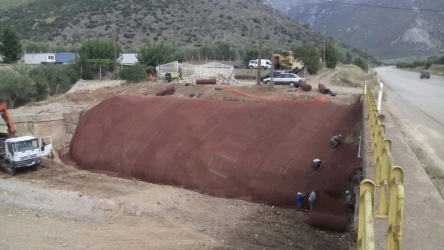 Due to a severe erosion problem on the slopes of Skitsa River, which is located in the area of Amfissa, local authorities requested the help of Maccaferri Hellas in order to propose the best solution. Maccaferri Hellas proposed the high performance geomat, MACMAT R1 6822GN after deep project design. The solution was checked using Maccaferri design software MAC.RA 1. The project is under construction by contractor TECHNIKON ATE and the installation is almost finished. MAC.RA 1 enables designers and specifiers to detail erosion protection methods for river channels. The designer can also make a rapid check on the flow capacity performance of the channel in both short term (unvegetated) and long term (fully vegetated) conditions; a fully vegetated channel is rougher than an unvegetated one, and will affect the flow of the river, potentially causing overtopping of the section. The protection of the environment has been a corporate goal since we first offered hydraulic works solutions and erosion protection solutions over 100 years ago. This application area involves protecting vulnerable soils, reducing erosion through stabilisation. Our philosophy is to offer clients a graded, logical range of erosion protection and drainage techniques so that the level of intervention is appropriate to the erosion risk encountered.